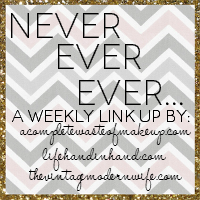 I have lots of Never Ever Evers this week! * will be able to keep in a BIG secret Megan and I have that we can tell you next week! * will not stop feeling overwhelmed this week, and next week, and the week after. * pack properly for my upcoming trips!